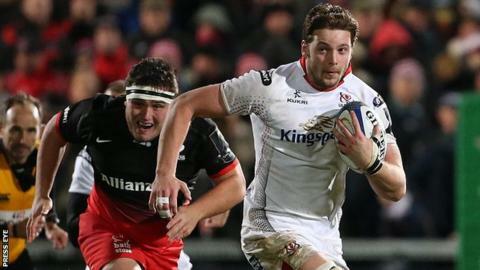 Ulster pair Iain Henderson and Tommy Bowe are set to make a return from injury for the end of season run-in. Back-row Henderson has a hamstring tear while wing Bowe is recovering from a serious knee injury. Rob Herring (hamstring), Paul Marshall and Alan O'Connor (both illness) are available to face Zebre on Friday. Nick Williams (shoulder), Luke Marshall (ankle) and Ian Humphreys (hip/back) could also return against the Italians as Ulster's injury woes begin to ease. The trio are rated doubtful but Sammy Arnold will be sidelined for up to three weeks because of a "low grade" hamstring tear. Dan Tuohy will have exploratory surgery on a "significant" ankle fracture before a date is determined for his return. Wiehahn Herbst will have a further assessment on a toe injury while Willie Faloon is set to see a specialist for a prognosis on a chronic foot injury. The return of Ireland internationals Henderson and Bowe would be a massive boost for an Ulster side sitting fourth in the Pro12 standings.